What's really special about 'Plenum', also known as 'Birch's Double', is that the glossy green foliage almost magically changes colour in the autumn to a fiery orange-red - so not only do you get wonderful flowers from June, but foliage interest too. It's low growing, reaching a height of about 25cm so is ideal for use as groundcover and also perfect for pots and containers in smaller spaces. It is easy to manage, tolerating most soils and with a hard cut back after a first flush of flowers in June and July, you'll likely get a second round well into autumn. Supplied as a set of 3 established plants in 9cm pots ready to plant straight out. 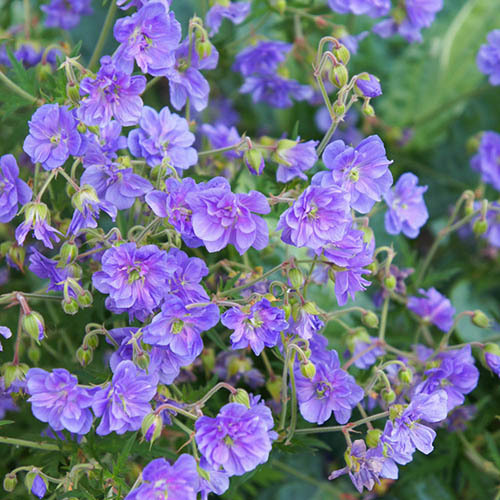 Geraniums are herbaceous perennials and are easy to grow and fuss free. They need minimal maintenance and are also generally pest and disease resistant. Once established, they're drought tolerant and even slugs, snails and rabbits leave them alone! Knock the plant from its container. Look at the roots – if they are circling around the compost, it is best to tease them out. To do this, push your fingers into the root ball along the bottom edge and pull. Do this in a couple of places. This should encourage the roots to spread into the surrounding soil.